Always been a fan of Magnum's events and the Sing-K event was one that I actually did look forward to. But unfortunately, the first session clashed with Carlsberg's Where's the Party event and of course, I chose that which I had a lot of fun relieving stress. It was like I went for a holiday at another country. That time, I was really stressed out with my job and had been awfully busy so I didn't do any blogging on it. But it was the best party I had so far. 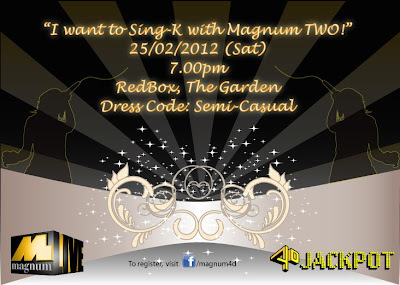 On the 25th of February, 2012, Magnum's sing-K night was back for the 2nd installment and good thing, I manage to go to that event. However, it was KK's last event for Magnum since he's moving on to other companies to work with. Although that day was a Saturday, I was working from 12.30pm to 5pm to help with some shifting work. When I got to the event, I was tired up and somehow that night, I wasn't in a happy mood, hence my blogging mode diminished along. So yeah, I don't have much to talk about in this event nor many photos to share, but here's my experience and some of my shots. The main highlight to me was the food! There's a sushi bar as well, but the portion and taste is a tad disappointing. and the 2nd game (which I participated in so no pictures!) was to drink beer out of a baby bottle and whoever is the fastest wins. So yeah, that's basically the event. LOL. Of course, Magnum also gave out lucky draw prizes as well. Travel? It's merely a place that's in my city. But you attended way more other events!